External Pumps Our premium selection of external pond pumps, are energy efficient and long lasting. Water garden pumps are an essential part of your filtration system. Our premium selection of external pond pumps, are energy efficient and long lasting. Water garden pumps are an essential part of your filtration system. 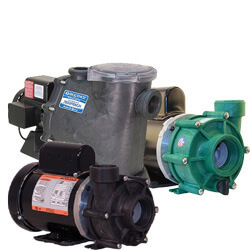 High Efficiency External Water Pump For Pools, Spas, and Ponds. Self-priming pump witha hydraulically self-balancing impeller and a sealed self-lubricating direct drive motor. Only available through Webb's Water Gardens. Made by Sequence Pumps, the manufacturing leader in high-efficiency, premium quality external pond pumps. The Quiet Drive Low Pressure series creates a great flow with minimal power usage, great for smaller ponds. The Quiet Drive Medium Pressure series offers energy efficiency and great performance at higher head pressure - a perfect blend of medium pressure and ample flow for the majority of ponds. Economy with efficiency. Valuflo pumps were designed to achieve a unique level of economy - with high efficiency in a reliable, long-life pump. From the compact model 750 and workhorse model 1000, there is a pump for every application. All units are assembled and pre-tested in the USA. PerformancePro Pumps is a company born of the idea that not all water moving needs are created equal. Specializing in the manufacturing of non-metallic centrifugal pumps that boast excellent energy efficiency, outstanding reliability and superior corrosion resistance. Featuring a wide variety of pumps for a broad range of applications. Every complete pump and motor unit is carefully assembled at their facility in Oregon and is fully benched tested to ensure quality workmanship and reliable operation.